Jupiter Audio is pretty much a one-man-show, the man being Gregory Singh. With a formal education in engineering, 15 years in audio retail and dissatisfaction with the status quo; he set out on his own. As is the case with many entrants into this industry, a hobby grows into an obsession or a career and some burning ideas pushes one into doing it "their way", hence Jupiter Audio. A refreshing change from many other manufacturers, Greg does not claim to have reinvented the world while designing his speakers. He summarizes his approach as such; condensing the best practices of many of the products he has come to admire over the years, using quality components and attention to detail. The attention to detail part becomes a recurring theme in any conversation with Greg, it seems like he has accumulated years of frustration watching products compromised in areas that easily could have been avoided. Some examples of this claim of attention to detail you will find in Jupiter Audio products are; connecting drivers to cabinets with t-nuts, hard-wired solder connections and dampening of the inner surface of connector cup. I could not gather any more examples, and based just on these items I would not award an attention-to-detail badge, but I do applaud each of these efforts. A design philosophy you will hear Greg repeat often is to avoid over-bracing the cabinet "live instruments seem to have a limitless dynamic range, and most speakers don't. Over-bracing (according to Greg, this is any bracing beyond just a rigidly built cabinet) limits the total energy output". He admits there would be some tradeoff with imaging and clarity, but to him the gains from the increased fun/excitement factor far outweigh the potential damage. Also the Europa, with its relatively smallish surfaces would not have a lot of resonance compared to a floorstander. Greg is not alone in this philosophy; Triangle Electroacoustique, Totem Acoustics and virtually all electrostatic/planar speaker outfits would consider the air-pressure resistance to the backwave of the mid/bass drivers offered by over-braced and over-damped cabinets to be avoided at all costs. The profile of the speaker is decidedly retro; with it's tall, wide and shallow disposition. Part of the reason is to extend the lower frequency extension by leveraging the diffraction from the front baffle; again Greg has used a design feature diametrically opposed to popular thought, which regards front-baffle diffraction as bad. If nothing else, Greg has to get credit for sticking to his guns and not being swayed by what the popularly accepted norms. Greg also prefers the retro aesthetic of this profile. The cabinet also has a port, deliberately placed front facing so as to reduce the rear wall dependence for bass reinforcement and allow more placement flexibility. I was able to use these speakers in my bedroom just inches from the rear wall, with no detriment to sound. I cannot say the veneer job on this cabinet is what I would have expected at this price point; there was a level of tidiness missing. But that is about all the nitpicking I can do with this product. The tweeter is a Silver Flute ribbon driver with a Kapton film. Greg does not like the sound of aluminum film ribbons (or any metal drivers for that matter), he feels it sounds a bit artificial but admits it has excellent imaging properties. Other factors for choosing this driver included its power handling ability (unspecified) and the reasonable price ($39.60USD each at Madisound). Greg thinks he may someday take a shot at replacing the plastic lens with wood or metal, more for aesthetics than sonics I suspect. The woofer is also a Silver Flute unit, 8" in diameter made from a paper/wool composite ( $31.20 each at Madisound). Attributes that attracted him to this driver were that it was fairly efficient, sounded right in the mid-range and had a cast-metal basket. The crossover is also sourced from Madisound and is set at a frequency of 2700hz with a second-order slope for the woofer and tweeter. There are two sets of binding posts supplied on the rear panel. I mention the price of the drivers, because it was available and Greg was more than willing to share it (I applaud his candor). So drivers seem to account for about 10% of the finished cost in this case. I would warn readers against jumping to conclusions or judging Jupiter Audio poorly, just because I have shared with you the cost of the drivers. Jupiter Audio probably falls way on the low side of the ratio of driver cost to finished price, when compared to the rest of the industry. Think about it; there is no enormous production facility, warehouse and distribution costs, marketing/sales teams, administrative staff, retailer markup, et al. The next time a manufacturer boasts of economic efficiencies because that manufacture their own drivers, you now know that there is not all that much that they could be saving you. If you have not yet been convinced that Greg is one to buck a trend, and not afraid to discuss his departures form mainstream then check this out�he does not believe in measuring the specs of his designs (even the specs quoted on the rear panel are estimated). When you consider that he is an engineer by training, this is huge. Greg feels that human hearing is much too complex to be able to ascertain enough of the complete picture by testing individual parameters of performance. He would much rather design by ear. Now you may think that this could be a case of sour grapes, where a boutique enterprise admonishes spec testing because such exercises are likely beyond their economic grasp. I am sure it takes an enormous investment to buy the equipment, procure needed space and administer such tests. I know a couple of fair sized magazines with a decent income stream that have struggled for years to find such capital, never mind a small startup manufacturer making that kind of investment. I would hesitate to say I am fully convinced that designing speakers solely based on measurements or completely without them is an ideal process. They also make an active version of the Europa and I am very curious about the potential improvement with that configuration. The active version sells for $2,000/pair. Compared to the BG Z-1 and my reference Dynaudio 1.3 MkII the Jupiter Europa had significantly more detailed and open sounding high frequencies. As is commonplace with well-executed planars and electrostatics, the sound seemed to materialize from nothing, and seemed it improbable to me that the two boxes in front of me were reproducing the music. The tweeters on the Dynaudio and BG were about at par for detail and tonality. Moving into the midrange, things changed considerably. The Jupiter added some bloom, making the over-sized flute sound rich and euphonic, albeit a touch coloured. The BG sat on the opposite end of the spectrum, with the sound a bit sterile and reticent, lacking the warmth and body needed for a convincing presentation. True to character, the Dynaudio sat in the middle of the road between the BG Z1 and the Europa. I preferred the sound of the Dynaudio in this comparison, but this is at fairly loud levels, it will be interesting to see the results at much lower volumes (see below). The Dynaudios had relatively more weight on the male vocals than the Europa or the BG. I fully expected the Europas to sound overly resonant on Mr. Holeman's vocals, but I was surprised to find them to be the best sounding of the three speakers on this track. The Europa's microdynamics on mid/bass notes had a naturalness that reminded me of my Triangle Titus EX. On the same track, I then reduced the volume setting by about 15db and compared the three speakers again. The Europas did lose some detail and resolution relative to the previous performance at higher volumes, but it did not lose as much as the Dynaudios, who in turn lost less detail than the BGs. I suspect, the Europas may have great potential as low-level speakers, but to ascertain that I will have to pull out my Triangles later on. I used this track as a stress test in comparison to the Dynaudio, at a level of 85db @ 1M @1khz(measured peaks of 95db at listening position). As would have been obvious from the specs of the two units, the Dynaudio sounded like it dug at least 10hz deeper. But as I had expected, the Dynaudio seemed to have perfect grip on every note while the Europa seemed to be getting flustered and the bass lines were not nearly as clean or defined as with the Dynaudio (I was starting to hear some distortion). This result was no surprise to me, it is the tradeoff I had expected given the design priority to not over brace the cabinet. Now, this finding also needs to be put in perspective, peaks of 95db are very loud. These levels are not only uncomfortable to listen to, but also prolonged exposure to these amplitudes will result in permanent hearing damage. In the US, the law requires hearing protection work in environments measuring 85db or higher (the peaks in this test were twice as loud), in most of Europe I believe the limit is 80db. This test illustrates that there are some drawbacks to the design priority of a minimally braced cabinet. I hope it does not replicate the listening levels in any reader's room. 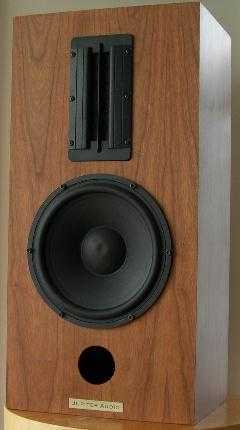 Having established the performance of these speakers at moderate and high levels, I was very curious about two things. How would they perform at low levels and how would they compare to my Triangle Titus EX speakers. These tests were done at a volume setting of 60db @ 1M @ 1khz. This level is extremely low, I do sometimes listen at these levels but only late at night in bed, long after my wife has fallen asleep (often, because there is an album/track I just have to listen to once more that day). At these volumes almost any background noise will mask the sound, so I realize this is not a practical or common level, but is perfect for such a test. This test focuses on the treble frequencies. I first tried on the Triangle. I could mentally piece together that this was a steel-string guitar, but my brain had to make more of that effort than the speakers did. It was a little like an impressionist painting, the information is in dribs and drabs leaving your mind to fill in the details and complete the picture. The Dynaudios surprised me; the detail and resolution were almost complete, down to the lingering reverberance of the steel strings. The Europa was at least as detailed as the Dynaudios but jumped ahead in overall presentation. While the Dynaudios made it sound like the guitar was far away in another room, the Europa sounded like it was the far end of the same room. This test focused on midrange frequencies. This time I tried the Jupiters first, and realized I had no urge to turn up the volume�all the detail was there and I was slowly slumbering into my chair, coddled by the tenor sax rendered by Mr. Getz. In comparison the Dynaudio was missing a little something. I can only summarize vaguely by saying that the music sounded reproduced and not present in the pervasive and anonymous way the Europa presented it, or to say that the Dynaudio was relatively a bit held back and not as open or immediate. The Triangle also gave the Dynaudio a similar spanking, for being a bad boy and not sharing all of the music. The real here showdown was to be between the low-level performance of the woofers of the Jupiter and the Triangle, and I would have to call it a draw on this track. This test also focuses on the midrange frequencies. Comparing only the Triangle to the Jupiter in an attempt to break the tie on the previous test, I would have to say it was a "photo finish". Repeating the trial many times, I picked the Triangle over the Jupiter by a narrow margin. The interesting learning in these tests came from comparing various speaker design philosophies regarding performance in the mid/bass frequencies. The Dynaudio is as rigid a cabinet and powerful a motor as you can ever find, it performed outstandingly well at moderate to extremely high volumes but was reticent at low levels. The Jupiter has a cabinet that is not overly braced, it started to distort a bit at very high volumes but sounded outstanding at moderate and low volumes. The Triangle offers no crossover circuit on the woofer in addition to a cabinet that is not overly braced, it sounded as good or maybe fractionally better than the Jupiter. Draw your own conclusions�I am exhausted. Sidebar - Listening to some of the Waterlily Acoustics tracks on these speakers was a special personal moment for me. You see, most of the musicians on the various albums (VM Bhatt, Ronu Mojumdar, Sukhvinder Singh Namdhari, Abhijit Banarjee), the recording engineer/producer (Kavi Alexander), the speaker manufacturer (Greg Singh) and yours truly; all hail from the Indian Subcontinent. The intoxicating fidelity and moment of ethnic pride certainly did bring a tear to my eye, Vande Mataram. On the plus side; consistently for the aspects of micro/macrodynamics, detail and tonality we have a moderately priced speaker that excels in the higher frequencies at all volume levels. It also performs outstandingly well in the mid and bass frequencies, as long as volume levels are moderate to loud. At low levels, I would prefer to listen to the Jupiter to the Triangle and Dynaudio (even though the Triangle maybe a hair better in the mid/bass region). Also, room placement is easy and flexible. On the negative side; minor items include a veneer that is a bit lacking. Sonically, there is a bit of colouration in the mid/bass region that sounds downright essential at low volumes and pleasant at moderate to high levels. It is only at extremely loud levels that the coloration steps over to slight distortion, you would have to accept that these are not speakers for use as a PA system or to listen to from a distance of maybe greater than 30 feet (cavernous room assumed). The LF cutoff at about 50hz is stated in the specs and should be expected of monitor speakers in general, I am of the strong opinion that the best values in audio are to be found in sub-sat arrangements. Overall, I can only say that I would not at all hesitate to replace one of my longtime reference speakers, the Triangle Titus 202, with the Jupiter Europa. Very well done. Thank you for the excellent review. It is refreshing to see a review that focuses on what I like to think is important: how the product moves you when reproducing music. This may be a trifle overstated in the audio industry, but is nonetheless true. As you've noted, I tend to eschew specifications. I don't have anything to hide, I just think that they specifications don't tell you how you as a listener are going to react to the sound of an audio product, particularly a speaker. That doesn't mean a verbal description is any easier, and I don't envy your job as an audio reviewer! A couple of points that I would like to bring up after reading your review: I think it's important to point out how a person goes about buying a pair of Jupiter Audios--they are sold factory direct only at this point, and are built to order. As such I have quite a bit of leeway with what goes into the finish, and can do custom finishes if asked. The pair you reviewed had an optional cherry finish, which would add $150 to the price. I am a little concerned at your findings about the finish quality. First, I'm not sure I've seen any speakers (perhaps you have) at this price point that are veneered on all six sides of the cabinet. Second, although I wouldn't say that my finishes stand up with the best furniture grade cabinets I've seen, I would say that they are better than a good number of larger, rather famous speaker companies. 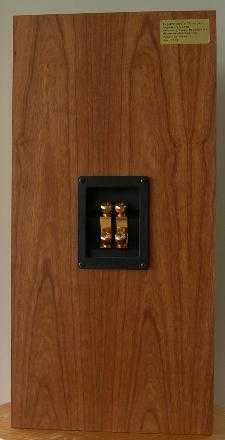 Third, the reason for veneering is not just to exude quality, but also to create a cabinet that is relatively neutral from a cabinet resonance perspective, without sucking the life out of the sound that a great many speakers do when they use some sort of cabinet damping scheme. Just about everything you said about the sound of the speaker I would have to agree with. I should point out that when you were testing the power handling and their ability to play loud that the 95 dB peaks that you were listening to is *very* loud relative to what the average audiophile is used to. I do have several friends that listen to music considerably louder than I do, so the power handling of the speakers was always a consideration. The Silver Flute tweeter isn't like most ribbons, in that you can pump a fair amount of power through it without damaging it. That's about it. All Jupiter products come with a 45 day trial period, and I a very sensitive to the fact that customers and potential customers deserve to be 100% certain about their purchase. This doesnJupiter Audio Europa come without a price, though! If the speakers are returned the cost of the shipping charge will be deducted from the refund amount. As a last bit of spam, let me also say that I feel I make one of the most musical subwoofers (the Subterfuge) money can buy, assuming you want to add a little more bass extension to the system. Maybe one of these days I can send you one to play with. Thanks again.